with David Garrigues. Learn in-depth fundamentals that form the basis of Ashtanga yoga including ujjayi, surya namaskara, vinyasa, jumping back and jumping through. The collection will also show modifications as well as lead you though the traditional count practice of the primary series. with David Garrigues. 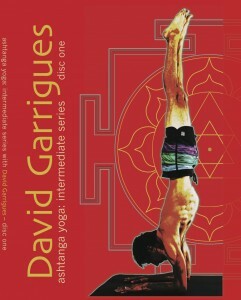 This DVD is a carefully prepared tutorial on the Intermediate Series as taught to David by its author Sri K Pattabhi Jois. Second Series, called Nadi Shodana, purifies the pranic channels of the body. Practice it and extend your breathing capacity, effect an energetic awakening that helps you access buddhi, the reflective, discerning, higher intelligence faculty of your mind. Become fit for dhyana, meditation, contemplative poise that yields dynamism, radiant health and Self knowledge. May we all continue to grow in Bhakti and Jnana. with David Garrigues. This two disk DVD set and book is made up of a set of breathing practices that will help you better understand how to breath in your asana practice, give you a strong foundation for learning pranayama and form the beginning steps to working with the Sri K Pattabhi Jois’s pranayama sequence.